If it seems like it was just a few days ago that we reported of the biggest ever inflow into equities, it's because that's precisely when it happened. It was then that according to BofA CIO Michael Hartnett, we observed a "non-stop euphoria cabaret" in which markets saw a record $33.2bn inflow to equity funds, record $12.2bn inflow to active funds, $1.5bn into gold (50-week high), as well as record inflows to tech & TIPS. 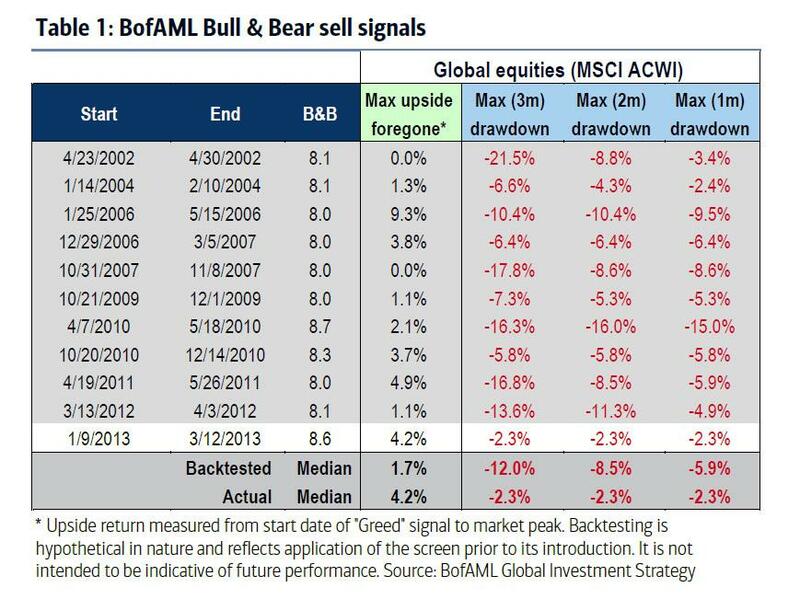 Incidentally, that was the day the S&P hit its all time high, and more importantly, the day BofA also said that its euphoria and panic-buying driven "sell signal" was just triggered for the first time in 5 years, and predicted a 12% selloff in the next three months. In retrospect, it took just two weeks because that post marked the peak of the market, and it has been non-stop selling since. But much more troubling than the selling, is the composition: after all, as we showed earlier, the "worst case scenario" according to both JPMorgan and Morgan Stanley is if the liquidation panic was not just systematic funds and various quants puking as a result of the surge in the VIX, but if ordinary retail investors had also joined in: that would be a nightmare outcome for the bulls, as it would mean that the sharp but concentrated relentless selloff, had spread to the broader investing world, and institutions would have no choice but to join. Today’s moves lower are likely not being driven by systematic supply – this appears to be more discretionary selling. Systematic supply from vol target strategies is largely out of the way now, while consensus trades are getting hit: NDX is underperforming SPX, momentum is down 1%, and the Passive Factor is up, indicating actively held names are underperforming names better held by passive funds. Well, we now have confirmation. 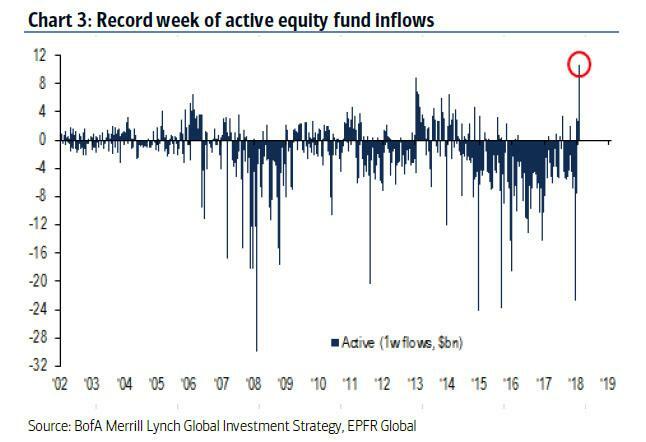 According to the just released EPFR weekly fund flow data, what was just two weeks ago a record equity inflow has become a record equity outflow, as the 10% drop in the US stock market has officially launched a selling panic. 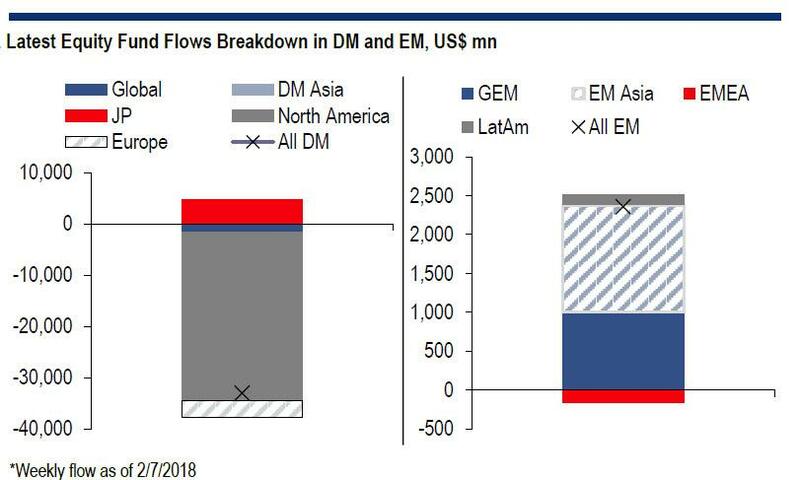 As Citi writes tonight, "in the week of 2/7/2018, bond funds had an inflow of US$4.0bn and equity funds lost US$30.6bn to outflows. 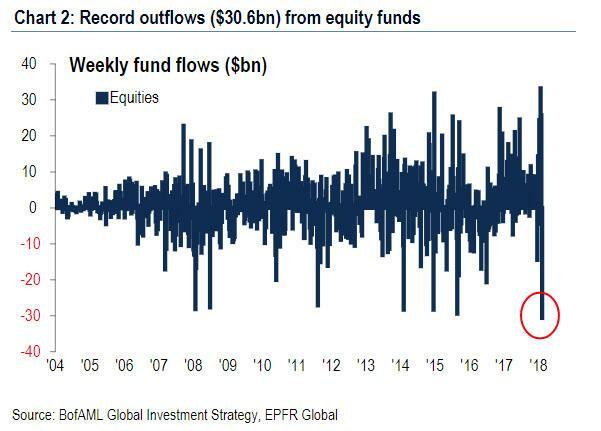 This was the largest outflow on record from equity funds, which just had their record high inflow of US$33.2bn only two weeks ago. The largest outflow had come from US funds which saw US$32.9bn of outflow. " Stated simply, this means that one no longer needs the VIX ETN, CTAs or risk pars to launch a liquidation panic: one has already begun, and retail is panicking, desperate to get out of stocks. Which means that a full on bear market is now in the hands of just two players: institutions, and corporations. In other words, if hedge and mutual funds dont step up, and if companies don't unleash a buyback tsunami, it's about to turn very ugly.